Whiskey Thief Tavern at 616 Davis St. The bar offers a laid-back atmosphere for college students. In some college towns, turning 21 is an occasion marked by rowdy bar-hopping and blurry memories. But Evanston isn’t exactly known for its bustling nightlife, and venturing into Chicago feels like an insurmountable trek on cold winter nights. As I approached my 21st birthday in what sometimes feels like the driest college town in America, I opted for a classic house party and promised myself I’d go out for my first legal drink another time. When that time came, I had a destination in mind: Whiskey Thief Tavern. The Davis Street bar is known for its strong cocktails and laid-back atmosphere — in other words, it’s a place where you can get buzzed while sitting comfortably in an intimate booth with friends or your latest Tinder date. I got to Whiskey Thief just in time to catch the end of the American Football Conference championship game. I must admit — it was a bit jarring to walk into a space expecting a speakeasy and instead finding a wall of screens that screamed “sports bar.” Nonetheless, I was happy to see the Patriots close out the game with an epic touchdown just after I ordered my first drink. When the game ended, the bar area cleared out and I found a chance to scan my surroundings. 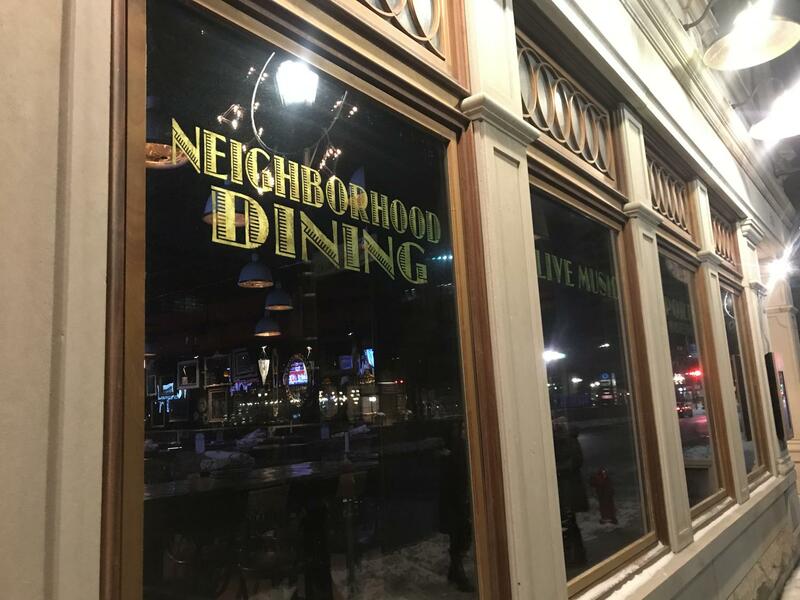 With its jazzy tunes and wood-paneled decor, Whiskey Thief Tavern leans into the Prohibition-era trend that seems to dominate the American bar scene right now. But this establishment doesn’t alienate the college market by putting on old-fashioned airs. Their playlist includes tracks by modern swing revival bands like Big Bad Voodoo Daddy and Scott Bradlee’s Postmodern Jukebox. The vintage mirrors and floor-to-ceiling bookshelf are as Instagram-worthy as they are nostalgic. To further draw in the 20-something crowd, Whiskey Thief offers trivia nights on Tuesdays, live music on Wednesdays and complimentary mimosas with weekend brunch, among other promotions. The promise of free mimosas alone would be enough to lure me back even if the signature cocktails were disappointing — though they certainly weren’t. I started out with the Mason County Mule, a bourbon cocktail with a Southern-inspired flavor. The combination of peach, ginger and mint masked the taste of liquor just enough for the drink to go down easy. As much as I wish I were a cool, complex “whiskey girl” who could drink Scotch straight, my tastebuds were grateful for the fresh and fruity flavor. Novice drinkers should definitely beware of the White Manhattan, one of the more booze-forward offerings on the cocktail menu. Just one sip of this concoction of white whiskey, vermouth and olive oil bitters was enough to make me gag. Though that’s more likely a reflection of my personal tastes than of the drink’s quality, I still recommend that you sip with caution. 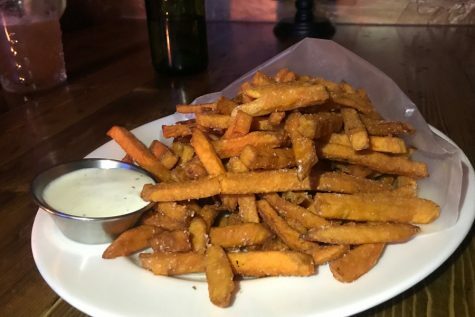 Whiskey Thief Tavern offers succulent sweet potato fries with a tangy aioli. The drink selection includes bold cocktails and a full page of different whiskey varieties. The Hanging Acrobat was my hands-down favorite of the drinks I sampled. The bourbon-based drink tasted like an apple-y whiskey sour with a hint of spice. The real star of the show, however, was the heaping plate of sweet potato fries my friends and I ordered with our drinks. The fries struck a perfect balance of crispy and soft, salty and sweet. And the tangy aioli dipping sauce was so good I almost asked the server for the recipe. If whiskey isn’t your thing, the tavern also offers cocktails made with vodka, gin and tequila, along with ample selections of beer and wine. If drinking straight whiskey makes your heart sing, though, there’s a whole menu page for you. I flipped right past it, but to each their own, right? I left Whiskey Thief giggling and feeling warm enough to brave the winter cold. While a night out in Chicago could have been a thrilling adventure, I was happy to catch up with friends in a cozy booth at my new favorite Evanston bar. Perhaps this underrated tavern-sports-bar hybrid is the casual college hangout Nevin’s mourners have been searching for.